FUE is generally considered suited to smaller procedures, opening the donor surface area after multiple strip procedures or in repair cases when the donor has little laxity or multiple scarring from previous poor procedures. Larger FUE sessions are possible but in a smaller % of HT candidates because the follicular units available will be less if you stick to an educated extraction pattern and only up to 30% harvesting per cm2. A Strip procedure will change the laxity of the donor as most are well aware, so can FUE if not performed well. Although FUE is a single punch extraction the technique, tool size, surface area harvested and extraction pattern can have just as detrimental effects on the laxity when looking at future procedures. The technique is something that is learnt and a talent, knowing the variants in skin textures, healing of different skin types, the splay of the hair within the scalp, how the exit point of the hair can be deceiving on where the hair angle lies within the skin. The “touch” of the doctor to be able to “feel” the FU is something that comes with time. For example a mechanical drill type tool maybe quicker and more efficient in terms of speed but it will carry no natural feeling between you and the skin, may it even jumps/slides slightly when entering the skin causing greater scarring and can be harder to control depth. Even by hand if the extraction is taken too deep it will cause unnecessary fibrosis under the skin surface and this will affect the laxity longer term. Tool size has an obvious factor, the larger the size the more likely to leave larger “hair less areas”, more skin tissue is removed and therefore wider peripheral trauma to the surrounding skin and FU’s; this could in the future reduce the potential numbers further, changing the skin elasticity. The surface area and extraction pattern; many like the idea of partial shaving, especially when the number of grafts is under 1000, it seems an ideal way to have FUE if you can hide the extraction area under the surrounding hair while it grows back. The problem arises when a minimal area of extraction is targeted, be it a long band shaved or a larger “box” like area shaved. Firstly the area chosen to harvest will probably be the area of highest density in the donor, hence being able to over harvest bit not make a great impact change on the density compared to the surrounding slightly lower density areas. This will impact future procedures, especially if a Strip is required because the area may have lost 40% plus of the FU it had reducing the Strip numbers and making the extraction from the Strip harder having to cut the FU out around the surrounding scar tissue. Then the laxity changes in a smaller area if over harvested, maybe not obviously to the touch but certainly when again trying to extract later, be it with either technique. Another problem with partial shaving is long term always, never short term; the likelihood is the total number of FU available will be reduced if a continued partial shaving protocol is followed. 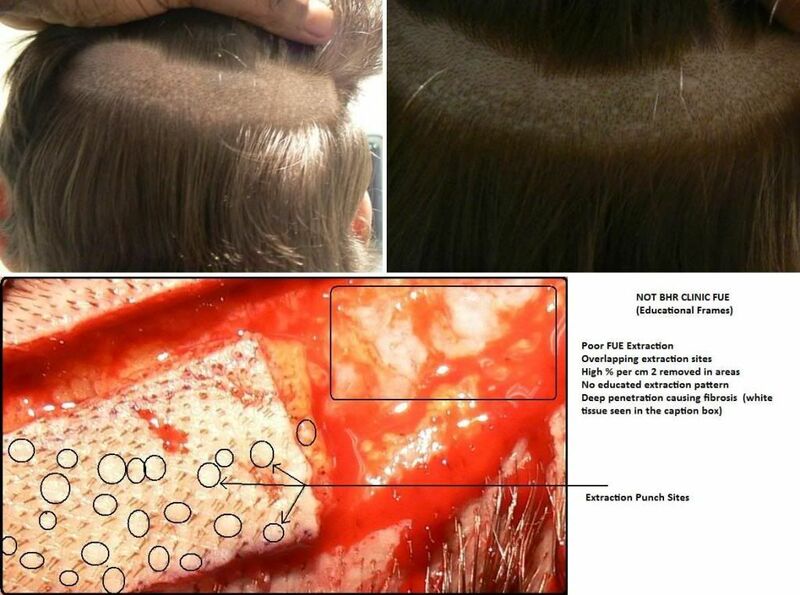 Moving from one area to the other with slightly different hair characteristics and different size hair groupings as you move around the scalp slightly defeats one of the true benefits of FUE, being able to open the donor surface area up to it’s widest possible point and determine the FU total then with an educated extraction pattern remove over the entire area. This will have the least impact on the density of the donor, cosmetically more pleasing if the hair is kept short, and from a long term aspect causes minimum trauma to the donor as a whole because the extraction is spread not localised in a small condensed area. Condensing the area will not just effect that area, it is like throwing a stone into water and the ripples move outwards, the effects spread; the smaller the stone less impact the larger the stone the greater surface impact and peripheral impact, so minimising the impact by spreading the extraction points as far as possible will only preserve your donor and minimise the trauma. Does Dr. Bisanga do body hair transplant? I have only seen FUE and strip, I don’t remember seeing body hair results from Dr. Bisanga. » I don’t remember seeing body hair results from Dr. Bisanga. Dr. B does offer BH, but is not one of the big advocates of the procedure and he does have a strict protocol for it. We receive many enquiries from virgin scalps who do not want to use their scalp donor and prefer to rebuild with BH, for us this is a non starter. Dr.B feels it is for repair cases and generally as a last resort when the donor has been so depleted. In this case we would offer a BH test and ask the person to give it some months and then assess the yield and the look of the BH before actually proceeding with any extensive procedure. Dr. B also feels that smaller BH procedures are more beneficial than larger. We have been using BH into scars recently with some good success and in the last few months with beard hair. Under the correct criteria when we feel BH maybe suitable we will offer a BH test first, this patch test, normally around 100 or so grafts is free of charge. marco, Glad you liked the post, I have some pictures that illustrate and to accompany but not sure one may be a little “bloody” for some. Pictures to accompany the initial post. What is the maximum amount of FUE grafts you recommend harvesting from the entire shaved donor area in a single procedure? What is the total number of grafts you can typically harvest over the course of many procedures before you consider the donor exhausted? » you consider the donor exhausted? Regardless how high the density maybe in the donor Dr. Bisanga does not believe in extracting more than 3000 FU in one session, so as far as we are concerned if the thinning area, say NW 4 and above and dependent on goals this may make the person not a suitable candidate for FUE. The rationale behind is the cumulative impact of so many open wounds healing can have a detrimental effect on the donor healing and may impair future procedures, be they Strip or FUE, laxity changes, FU ripple effect of angle changes to adjacent FU’s for example. Then there is the extraction pattern, obviously the more taken in one pass makes it harder to sustain an educated extraction pattern and not over harvest in areas, 3000 in one procedure will allow for this without the potential to over harvest or complicate the extraction pattern. The total number that can be extracted before the donor is exhausted is relative to interpretation. As Dr. B does believes in harvesting only intact FU’s and harvesting between 25-30% less miniaturisation we are probably considered to be conservative with our approach. With the experience we have and the number of FUE procedures we do it is not a coincidence that we have only performed a handful of cases over 5000 grafts (over multiple ops); basically the donor on an average guy cannot take more unless you are willing to over harvest and leave the area noticeably thinner and noticeably scarred or “hair less”…leading to complications in the future. So, to answer your question, around the 4500 mark would be fair to say as an example. 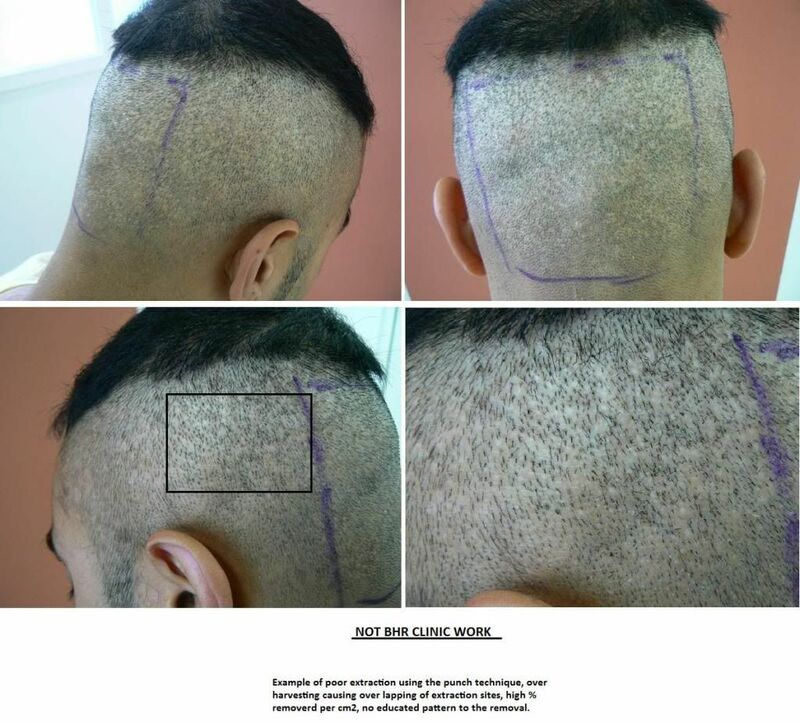 The saving grace with donors that are over harvested is the general lay of the hair, downwards; even if 50% is removed you still have the illusion of thickness because each hair overlaps the other from top to bottom hiding the damage, but forget future FUE procedures and even Strip would be made difficult with the amount of scarring removed within the strip. » scarring removed within the strip. Could you clarify if you perform hybrid procedures with strip and FUE in one session. If so what kind of figures would that kind of procedure relate to. Thanks. Yes I can confirm we perform hybrid FUE/FUT procedures in one session. Figures will obviously be relative to the virgin donor density but if we say a below average density you can expect 5000-5500 grafts and if above average 6500-7500. If your donor density is high then you FUT can reach 6000 plus alone and then FUE would increase further, but most cannot reach these numbers. FUT will be the predominate number always with FUE being around 25-35% of the figures. » Yes I can confirm we perform hybrid FUE/FUT procedures in one session. » around 25-35% of the figures. Not sure I have these figures right but if 25% of the safe donor is about 4000 derived as the max for safe FUE then the follicles in the safe zone must be about 12000. If you can take by strip 5500 more or less then this means that clinics remove over 40% of the safe zone by strip. Is that correct? If not then what is the percentage removed by strip. Maybe you could let us know how many sessions would be involved for a resonable scar. If we say 25% then 4000 FUE would be around a 16,000 donor, if 30% then close to 5000 available to harvest via FUE. The Strip donor is hard to compare to the FUE donor in actual harvesting and I think this is what makes it hard to differentiate between the two techniques in respect of the figures. With Strip, the donor safe zone is effectively removed so the surface area although changed has lost little density throughout the area. The strip removal is typically around the occipital bone and generally the highest concentrated density of FU in the donor area, also not having to be mindful of over harvesting because a definitive area of tissue is being removed only leaves the measurement of the strip to decide. To remove a 5000 plus strip requires a high donor density, good laxity, technically proficient open/closure technique, as well as a decent measurement of the scalp. FUE relies more heavily on a good density of FU than any of the other of the Strip parameters, the exception being the measurement, the NW class now/future and miniaturisation present or predictable affecting the safe zone size. If we took the scenario 25-30% harvesting 4000 FUE of 16,000 safe zone then the density parameters would be around 75-85 average; if that were a Strip then the harvest potential would be higher, still allowing a further 2000 plus FUE to be removed in the same procedure, and a future Strip and potential FUE. The density factor becomes a greater issue the lower it becomes between FUE and Strip, if the scalp characteristics are good it is still feasible to reach 3500-4000 with a Strip in one procedure from a below average density whereas to reach that with FUE would mean pushing it, in our book anyway; also the fact we will not harvest more than 3000 with FUE in one sitting anyway. In respect of a scar, it is always hard to predict the laxity change after a larger Strip is removed but it is fair to say another Strip procedure could be carried out of a decent size and still expect a good closure. » » » to. Thanks. » » Yes I can confirm we perform hybrid FUE/FUT procedures in one session. » » around 25-35% of the figures. Why do you get so worked up over these numbers? Your forum pics show that you still have good hair, and you have a nice shape scalp, you can always pull off a buzz cut and look 100% natural with a low density fue. » pull off a buzz cut and look 100% natural with a low density fue. Obsesive compulsive disorder; Body dismorphic syndrome; I used photos that made my head look a better shape than it is; I want to leave my options open; I am the sort of person that needs to know the molecular structure of an orange before I will eat it. on the other hand you have a good point… go for coverage and don’t worry so much about the density. Definately worth considering. Why have none of the docs I saw suggested that??? » » pull off a buzz cut and look 100% natural with a low density fue. » an orange before I will eat it. » none of the docs I saw suggested that??? » One thing is for sure, grown out hair with large bald spots is not for me. Go ahead, as long as you don’t crash it into a building then I don’t see the problem! just a thought 180cm2 covered at 30fu/cm would require nearly 6000 which is a lot for FUE and would be very very thin. It doesn’t seem like these men will need another hair transplant for atleast 10-15 years (if anything) because not only was the grafted hair coverage very decent, but there wouldn’ be too many of their own hair left to fall out as they barely had none to begin with. And suppose they did go in for another hair translant, they would have more than enough for one final and great FUE hair transplant. I very much doubt the next hair transplant would require more than 2,000 grafts though. That’s a total of 6,000-6,500 grafts for completion. That being said, you don’t belive you would be in the same shoes as they? I’m curious to know what your take is on this because I too have a concern for multiple hair FUE hair transplants without having enough donor hair for decent density and coverage. But on the other hand, I see FUE hair transplants like of these gentlemen’s and I become optimistic again. There are more results like these, but you get the picture.